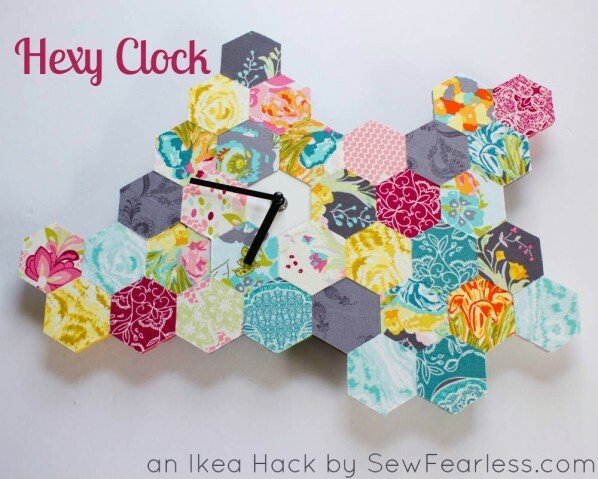 The trouble with jumping on the hexy EPP bandwagon is that you start seeing hexagons everywhere – the tile on bathroom floors, road signs, honeycombs, and most recently… a picture of a clock in the new Ikea catalog. This clock! 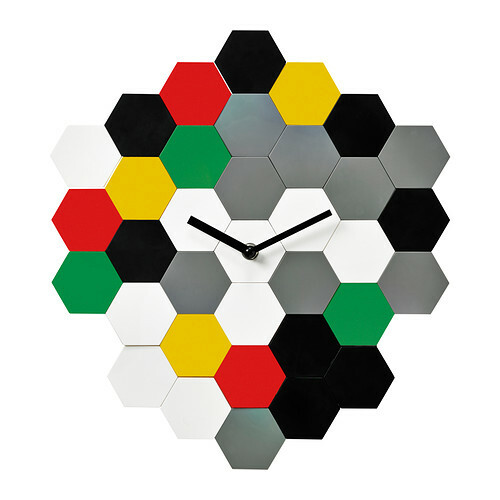 Oh man, it isn’t just a hexagon decorated wall clock. 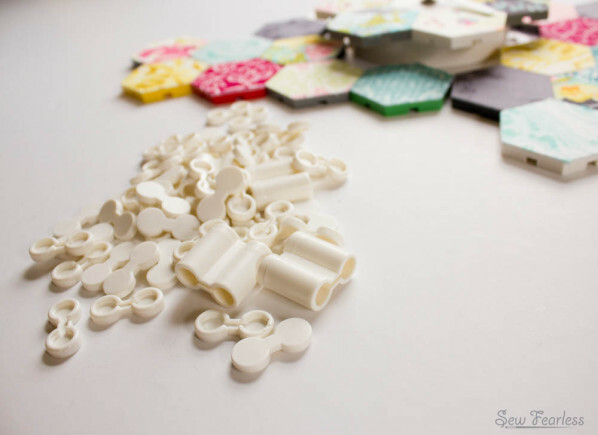 the hexagons are REMOVABLE, and can be re-arranged any way your little hexy-lovin’ heart desires. 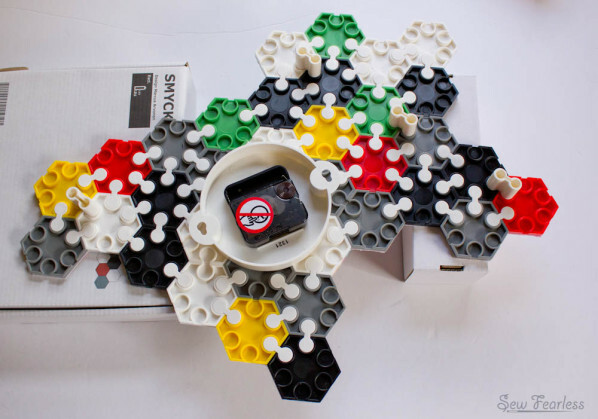 Of course, the colors were a little too “Lego” for my taste. … but it was nothing a little fabric couldn’t fix. Fabric makes everything better. 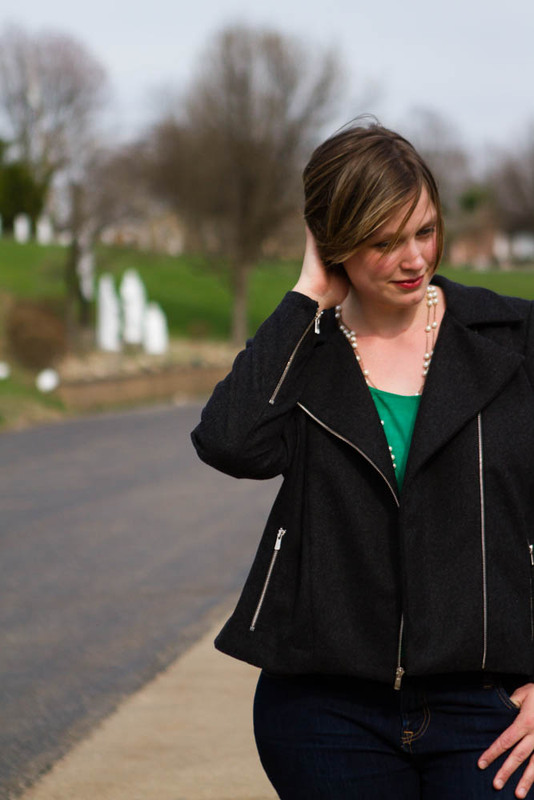 In this case, fabric makes it way… way… better. 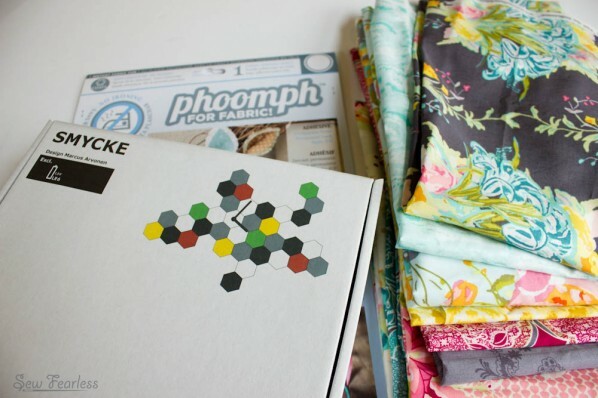 To attach fabric to a loose hexagon, cut out a square(ish) of Phoomph just a bit larger than the hexagon (Figure A). Remove the paper backing on one side to reveal the adhesive and stick it to the wrong side of the fabric (Figure B). 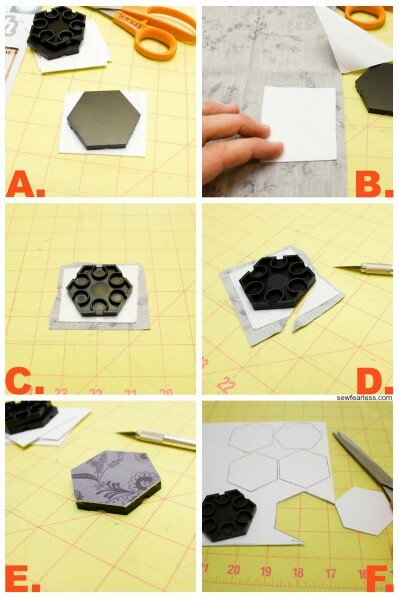 Remove the second paper side and stick the hexagon smooth side onto the Phoomph (Figure C.) Use the art knife to trim off the extra Phoomph and fabric (Figure D and E). 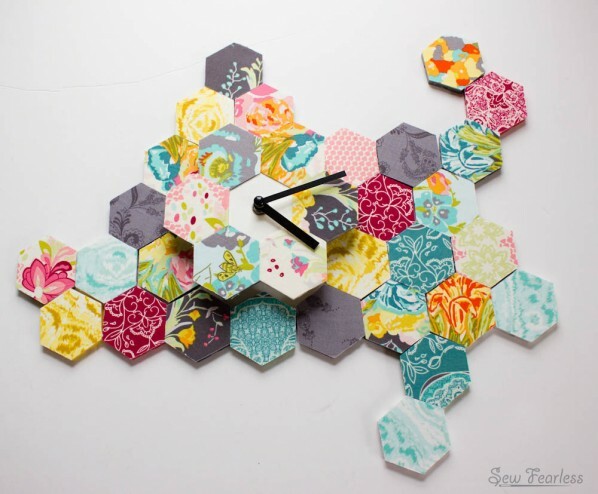 Repeat to cover all 28 loose hexagons. 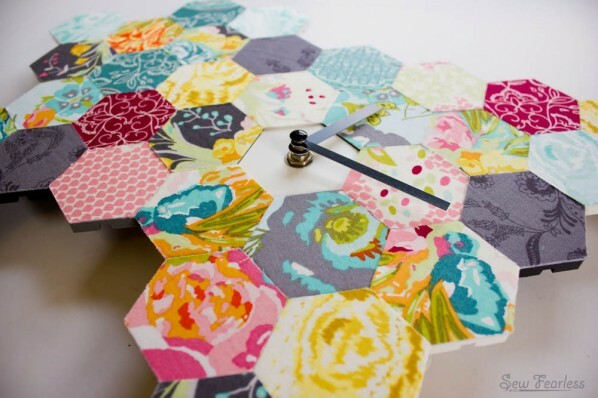 This method results in nice clean edges on each of the loose hexagons but it won’t work for the hexagons on the clock face. 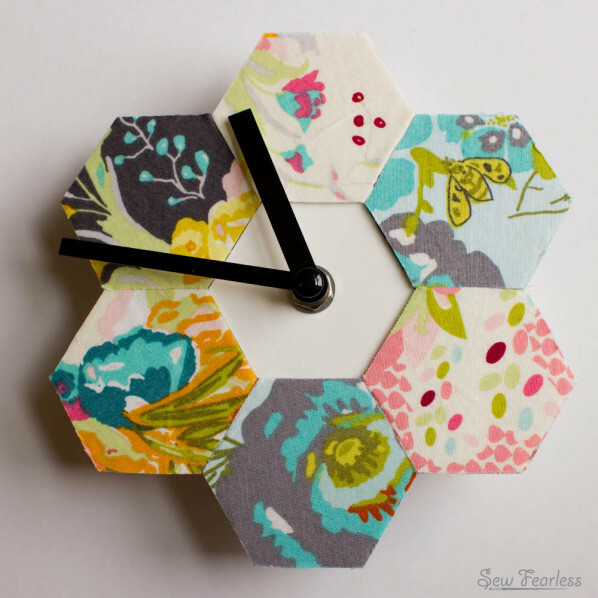 To cover the six hexagons on the clock face, cut out hexagons from the Phoomph using a loose hexagon as a template (Figure F above). 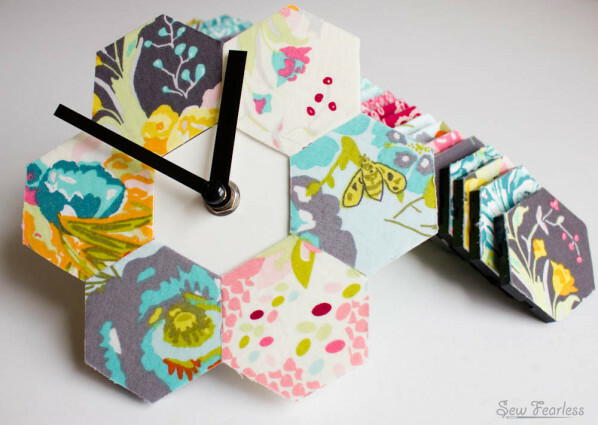 Stick a Phoomph hexagon to the wrong side of the fabric, trim down the fabric to match the shape of the Phoomph, and then the fabriced Phoomph onto a hexagon on the clock face. …and then attaching them to the clock face using the connectors from the Smycke clock kit. Hi Jodi, this is AWESOME!!!! I lOVE IT. 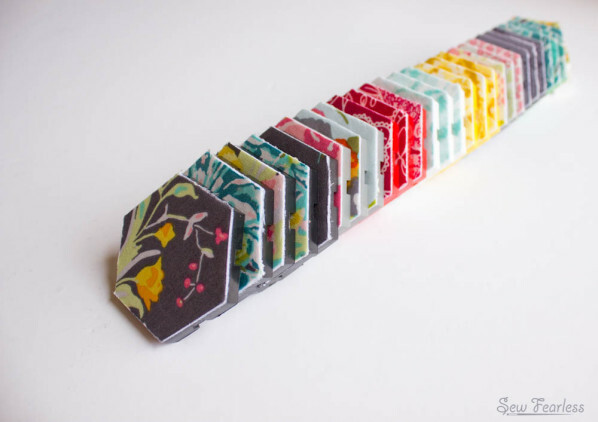 My brain is scanning my fabric library in my head – no – need a new charm pack. I need to go to ikea! Have fun! and share pics! It’s beautiful, Jodi! Love it! Thank you and thank you for sharing on Makezine! great idea! love that fabric collection! You are a genius. The end. Omg. I think I’ve convinced my husband to buy this clock. Lol! It’s so pretty, Jodi! I think this is a fabric project that even I can handle! LOVE! You can cover the clock face. on the front you see the hex nut? take that loose, there maybe a nut under each of the hands as well. It is just the same as you would find at a hobby store. easy to take apart and put back together. 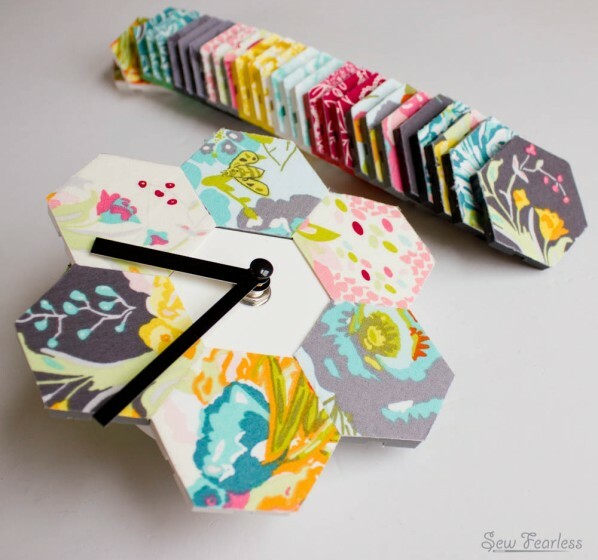 In fact you could buy the clockworks at the hobby store cheap, get cardboard(cereal boxes or the like); cut, cover and piece the same as paper piecing (except leave the cardboard in). And you would have the same clock but much cheaper. play to your hearts content. LOVE LOVE this idea! 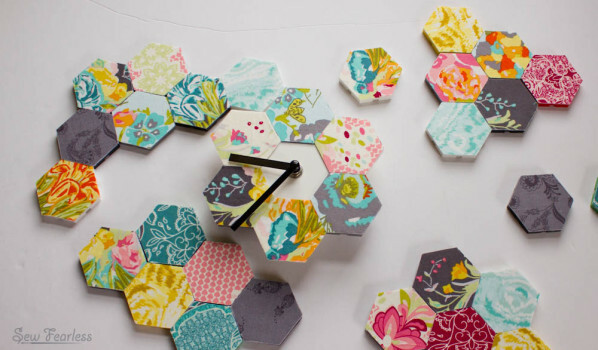 Already ordered my clock- ready to make it cute! Did you use the soft or stiff phoomph? And you only needed 2-3 sheets? Thanks! How did I miss this when you posted it?? Genius, simply genius and awesome.